Tomorrow (July 10, 2016), many of my clergy friends and colleagues' sermons will seek to approach recent events pastorally. The deaths of Alton Sterling and Philando Castille, as well as the deaths of five Dallas Police officers, are bleeding wounds in our national history. Prejudice, racism, justice, and white privilege will be certain themes addressed from the pulpits. If you're preaching from the Revised Common Lectionary, I have a word of advice on the Gospel reading. Be careful on how you call the parable contained in Luke 10:25-37. 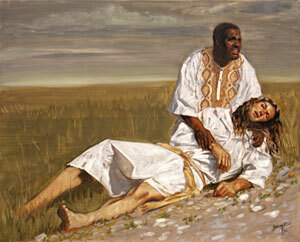 Traditionally the parable is called "The Good Samaritan." The language we use tends to frame our collective thoughts, attitudes, and actions. If we refer to the man that helps the wounded as "the good Samaritan", instead as "a Samaritan" (v. 33), we are reinforcing a prejudice that appears to be embedded in Jesus' audience: Samaritans are bad or evil people. Try this exercise. Imagine someone tells you the story of "the good American" (or Cuban, or whichever your nationality may be). How does it sound to you? How would you feel? I know how would I react if I hear the phrase "the good Puerto Rican". During this terrible week, I've read many comments and opinions in social media. Among the unfortunate expressions I've seen are the following: "Not all police officers are killers"; "Not all black people are thugs"; "Not all Muslims are terrorists." I find the underlying ideas in these phrases very, very disturbing. We should be aware of our prejudices and preconceptions in our attempt to share a healing word to a disturbed world. And "the parable of the good Samaritan" is a unique opportunity to model the value of all human life beyond our prejudices and labels. May we be a witness of love for all God's children.